So, how did my Travel with Fascinator plans stand up? I spent this morning, my first morning back, blow drying my hair between wiping a bottom and icing a bruised head, with three little people hanging off my legs who sounded like a virgin violin playing troupe. I went to get everyone dressed this morning and realised it was Chinese dress up day at school, so spent the morning RACING to make a Sensei outfit, all before 8.15am. All the while (1.5 hours of ‘while’) I was YELLING for someone else to get himself dressed (which he has proved he can do in a flat 2 minutes), and trying to keep an eye on that wee wee getting itself in the potty rather than the lounge crevices. In Melbourne I only got myself dressed. Quietly. With a champagne. This morning I went to make 2 lunch boxes and opened the fridge to NO BREAD. Yes, NO BREAD. Then there was outcry – loud and long, when I said there was NO MILK left to have the routine glass of milk after breakfast. In Melbourne I had coffee, after Panini, after coffee, after glass of wine in the middle of shopping in Myers, after dumplings, after pub meal, after cocktail, and then some more coffee. And of course, some champagne. All of which someone else made for me. They had bread. And milk. And gin. 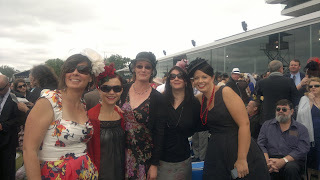 On Melbourne Cup day, I got ready with my gaggle of beautiful girlfriends. We fluffed hair for each other, drew on glamour-making makeup, slipped on stockings, laughed at how silly we were to wear such high heels to an all day event whilst packing our foldable Party Feet into our handbags – handbags which were all, incidentally, too small to fit a single nappy or drink bottle. We popped on our outfits and fascinators which had been under construction for the few days of shopping beforehand, and made sure the champagne didn’t ruin our lipstick. And off we went, without strapping anyone in, wiping anyone’s toothpaste off their face, or dealing with a last minute poo, chattering about the horses, fascinators, frocks and champagne ahead of us. Packing? The Right Outfit? Really, it doesn’t matter when you have gorgeous friends and can indulge in a little ‘no kids’ time out. Not to mention champagne.